Health Fair Connections | Can someone please call me? Unfortunately, at this time, we do not have the capacity to handle phone calls. You're able to find the answers to 98% of the questions you might have in the help posts (you're reading one right now) located on HFC's Vendor Help Center page. However, if you have a particular question you can not get answered at HFC's Vendor Help Center, you always have access to the contact us form located at the bottom of the screen. If you message us, we’ll try to get back to you within 36-48 hrs. Just because you can't directly contact HFC does not mean you can find and message/call the contact for the company hosting the health fair with your questions. These companies are using HFC's platform to help streamline and make the planning process much easier on them. They don't want to have "outside" conversations by phone or email about their health/wellness fair. Please don't make us do that! 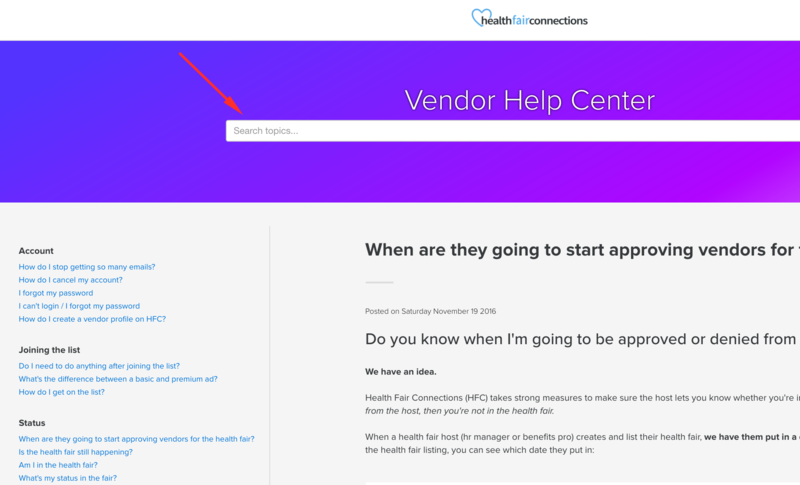 So, we encourage you to take a few mins and read/scan through the help posts on HFC's Vendor Help Center, and we assure you that you’ll be able to understand everything.